Gill Slocombe awards Megan Phillips with her Queen's Guide Award. Guides and leaders at the recent LINX 2015 were pleased to welcome a VIP guest to camp. 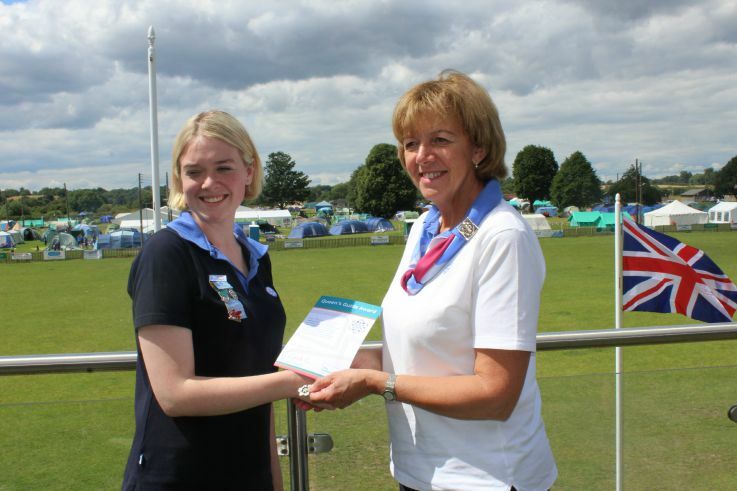 Gill Slocombe spent time at the camp, meeting girls and their leaders and presented a range of awards to our members. In particular, Megan Phillips (photographed) was presented with her Queen’s Guide Award – the highest award one can work towards in Girlguiding. For more information on the Queen’s Guide Award, please visit this page on the Girlguiding site.